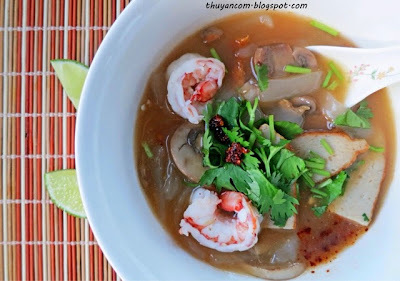 I already post a recipe for Banh Canh Cua (Crab Tapioca Noodle Soup), which is made with a pork base broth and requires fresh crabs. This version has no meat product (beef, chicken, poultry) and does not require fresh crabs. I usually tell my family it’s my “lazy” version of banh canh, meaning I spend less time on the broth. I usually make the noodles from scratch because it taste better and it’s cheaper then store brought banh canh noodles. Please refer to my Banh Canh Cua recipe for instructions to make homemade noodles. For this recipe I use dried prawns and a lot of mushroom to make the broth. It is said that mushrooms give a natural umami taste, savory taste, so I go crazy with the mushrooms. Instead of fresh crabs I use jar crab meat in soya bean oil (the same jar I use to make bun rieu). Shrimp, mushroom, and fish cake (cha ca) contribute to the “meat” of the soup, you can also use frozen shrimp and fish balls. 7. It’s best to make banh canh per bowl. I usually have a little sauce pan to make each bowl of banh.